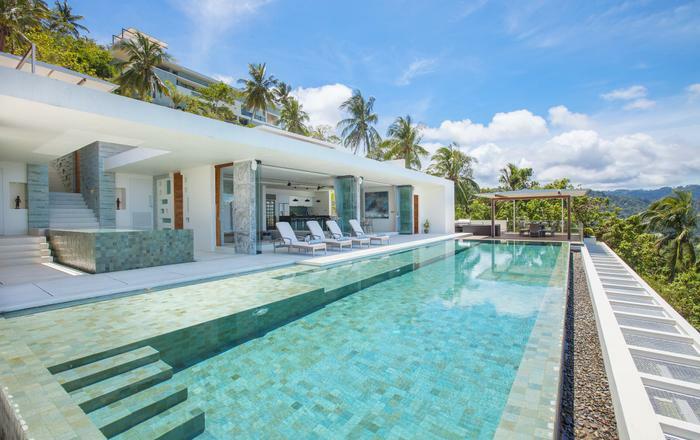 Baan Bon Khao is a newly built luxury villa with contemporary furnishings and decorations and all of the modern conveniences. 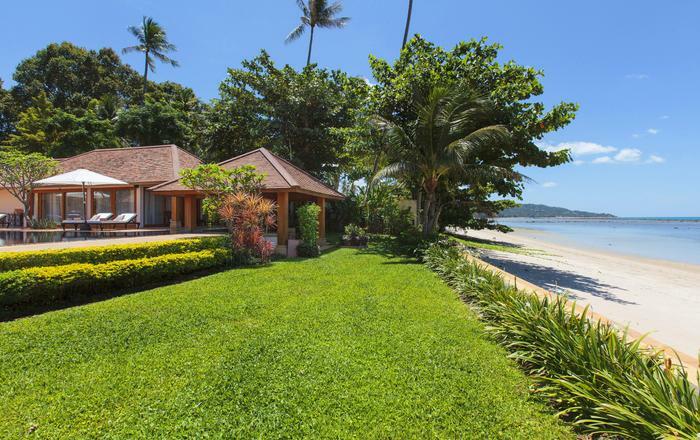 Situated on over 1600 square meters of private walled land the villa is secluded and comfortable, surrounded by beautiful internal and external tropical gardens extending to the sea views beyond. 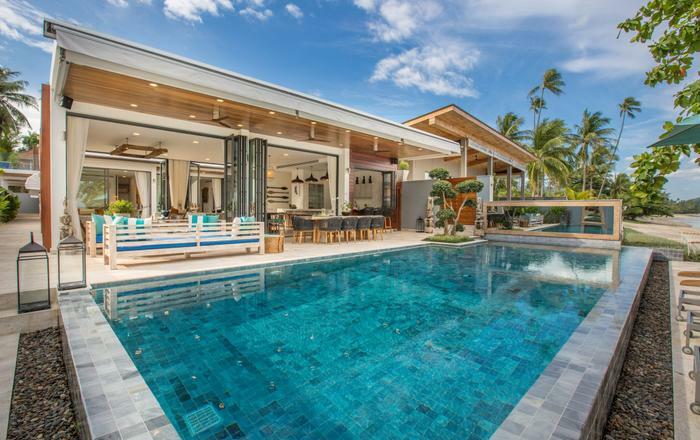 The crisp modern design of this exceptional villa provides light, airy and spacious interiors. The substantial open-plan living area with accompanying balconies allows guests to enjoy the seamless blending of interior and exterior spaces. Whats more the lounge area is lovingly designed with only the most comfortable furnishings making it a great space to relax after a long hard day by the pool. 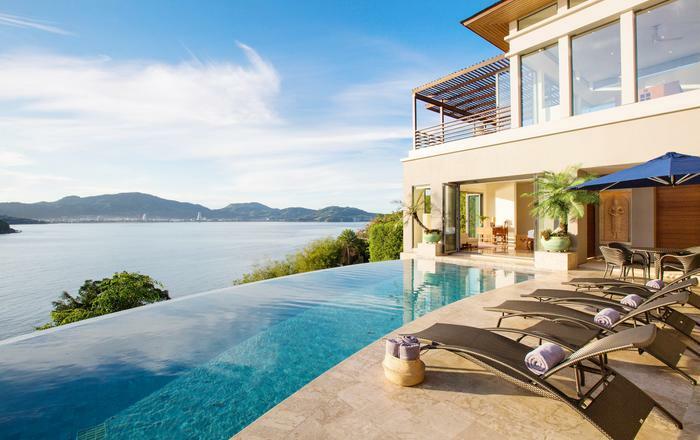 A floating staircase leads to the pool with an inbuilt bar, then outdoor Sala with sunbathing day-beds and the barbecue area with the further garden areas extending beyond, all draped with stunning ocean views. Inside the villa is furnished and equipped to a high-spec throughout with bespoke art-work and high-tech zone-based audio and visual equipment including an AV/theatre room, a separate billiards/games room and satellite TV in three locations. The top-floor includes a fully-equipped modern western kitchen and breakfast bar that opens out on to the landscaped gardens and waterfall. Upstairs we also have indoor and alfresco dining spaces and an intimate outdoor bar, all with spectacular 270° ocean views. If you don't fancy cooking then a chef service can also be arranged. 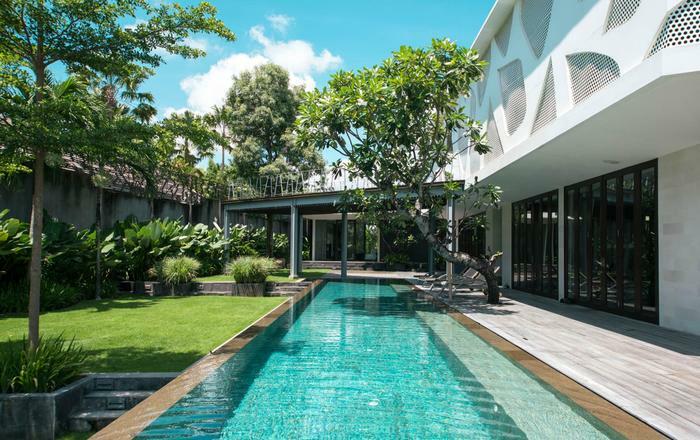 The villa is set with 1600 square meters of private gardens in which guests are free to explore the two outdoor bars and the more private Sala and garden areas. 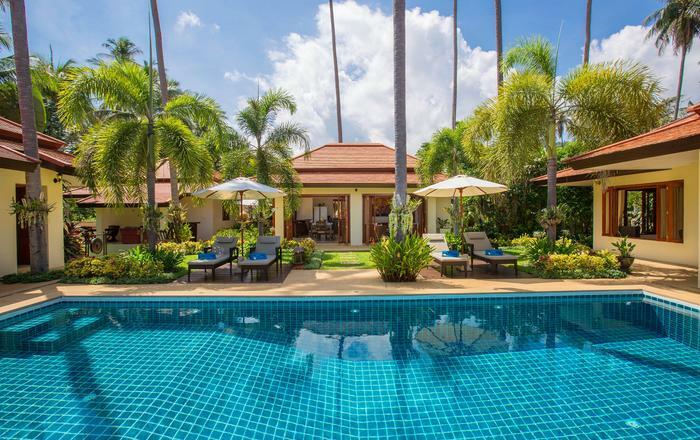 However the crowning feature of Baan Bon Khao's garden is the large infinity-edge swimming pool. It offers a 25m lap length, a 2.5m deep diving area, built in day-beds and umbrellas and an adjacent Sala complete with lilies and fish. 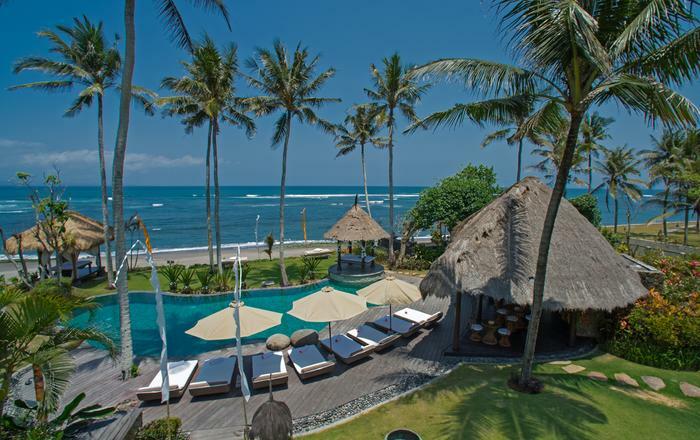 The villa has two master suites and four large double bedrooms. All of the bedrooms are designed with soft pastel colours and large floor to ceiling windows to create a light and airy atmosphere. 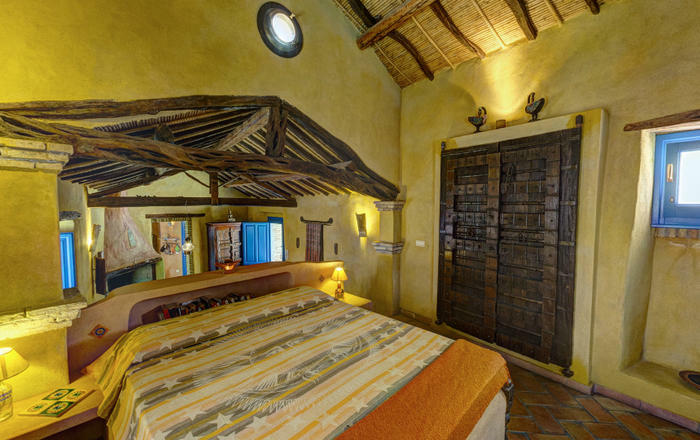 Each bedroom also has air-conditioning, roof-fans, en-suite bathrooms, private terraces and spectacular ocean views. Most bedrooms have fold out sofas to offer sleeping options for children. 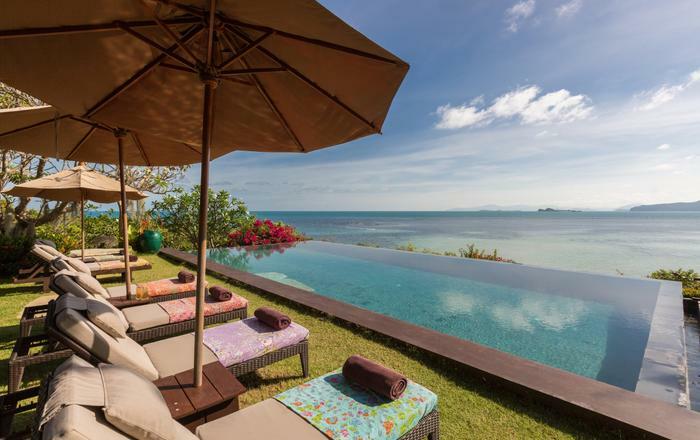 The villa is located in Choeng Mon, the top East-Northern corner of the island. The Estate is just 10 minutes from the airport but out of the flight path so it remains tranquil and quiet. Beautiful Choeng Mon beach is within walking distance and both the popular Chaweng beach with its shops and nightlife and Bophut Fisherman's village with its vibrant restaurants are only a fifteen minutes’ drive away. Baan Bon Khao has three full-time staff, including a live-in English speaking manageress, who will all cater to your every need. We can also arrange a chef service, babysitting service, chauffeur and/or masseuse services at a small extra charge. Best vacation ever!!! Fab view, Fab service, Fab pool, Can't say enough…. Dream vacation Noo was amazing will be back !!! "Sippy"
Thank you for taking such good care of us! Beautiful villa! Enjoyed every moment " Pascal"
Noo has been and amazing maid and heper throughout our stay. Already planning our next trip Thank you so much!! "Robert"
One of the most amazing places I have over been to it is a sad day having to leave here. Thank you Noo for your wonderful hospitality "Mark"
Best place I ever stayed in amazing view, facilities and perfection to detail. In addition service is excellent, Thanks Noo. " Dennis"
Thanks for your great service and help and for always being so friendly. The best experience of my life so far. "Brian"
Amazing Villa, amazing hospitality Noo + Khun Pee - Excellent service amazing experience Thank you " Siddherth Clutelie"
Amazing villa!! Great service!! Good food!! Good Housekeeping thanks for taking good care of us Thank you "Adunentha"
I would like to say, Thank you very much! To Ludmila and Polina, our staff on the villa especially to Noo for everything what you did for us. We never forgot these 14 days on the amazing villa and hope we'll back soon! Most importantly, great people! Thank you for a really enjoyable and fun holiday. Thank steve & Julie for an amazing stay and also to your nice team - So helpful & friendly. It's been great. What a gorgeous place! We were from Pakistan and the UAE and we were blown away by the villa!! Epic views, fantastic staff and amazing memories! Can't wait to be back! Will definitely recommend! It just felt totally out of this world to be here. Felt like home and loved waking up to the picturesque views, the quiet and the tranquility. Noo and her team were amazing and much love and happy memories to take away.